Health risks. Complications. Environmental pollution. Controversy. A new documentary highlights how all of these issues surround the use of mercury in dentistry. 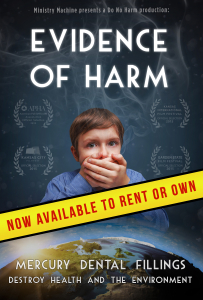 “Evidence of Harm” is a comprehensive story of why mercury should be banned in dentistry and is a must see for anyone working in the dental industry. Randall Moore, a filmmaker from Kansas, became interested in the issue when his father became ill with Alzheimer’s Disease. After much research, Moore discovered that mercury fillings, otherwise known as “silver fillings” have been linked to Alzheimer’s Disease – and his father had a mouth full of them. Mercury is a known neurotoxin, and federal agencies limit its exposure to humans. Yet the dental industry has used silver fillings – which contain almost 50 percent mercury – in peoples’ mouths for more than 150 years. “Evidence of Harm” uses personal accounts, scientific evidence and the history of mercury’s use to showcase why. The reasons range from political agendas to greed to ultimately, stubbornness. The health complications widely range in different people, making the diagnosis difficult. Many people who suffer from heavy metal toxicity exhibit symptoms such as low energy level, headaches, digestive issues, throat and mouth issues, and the list continues. Moore highlights the fact that victims of mercury poisoning will often feel “crazy” because many doctors will tell them there’s nothing wrong with them, and families don’t understand. The documentary follows a dental assistant, a journalist and a researcher to advocate the importance of not only mercury-free dentistry but also mercury-safe dentistry. By purchasing this movie through the International Academy of Biological Dentistry and Medicine, you will be donating a portion of the profits to those in the industry fighting for change. Help end the use of mercury in dentistry.